On this Martin Luther King, Jr. Day when I’m writing this announcement, I’d like to take a moment to say a word of thanks. Who would I like to thank, besides Dr. King? Well, I’d like to thank all of you who have stopped by Green Day Mind to read and say hello. I appreciate your visits and comments and I hope we all have a great 2011! I’d like to also take a second to thank those people throughout time immemorial (like Dr. King) who have contributed some positive hand to the rights of man, beast, and land. The world is a crazy place and we each have our own beliefs, but it’s nice when people can come together on at least one or two basic issues. Your issues will differ from mine, and that’s OK. My beliefs tend to center around the ideal that people deserve life, liberty and the pursuit of happiness, free from genocide and war with the ability to take care of their families and community, have safe water, healthy natural resources, and sustainable energy. While that sounds all high-minded, let’s not forget the most basic right, the inalienable right to party (or celebrate, you take your pick)! While everyone won’t agree on everything, I hope we can concur on one thing: that a clean, robust and healthy planet is probably better than a filthy, dirty and rotten one. I think about the environment at lot, particularly about the waterways of the world and especially about the ones here in New York City. New York is a City of Water, filled with massive and powerful rivers, tiny inlets, and an ocean just a subway ride away. If there’s one thing that is true, humans and animals alike cannot survive without clean water. While that’s true, we also need to use waterways for transport and industry. How we balance the two needs, human consumption and industry (as well as sanitation issues), makes all the difference between dead and healthy seas. New York City’s waterways were a mess from industry and pollution, but they have come a long way toward health and less pollution over the last ten years. Once absent dolphins and seals have been spotted here and there in the East River in small numbers, a sure sign of potential health. Clean rivers prompts crazy people like me, as part of the Long Island City Community Boathouse, to take little boats out for kayaking good times. The kayaking is free at the LICCB and we encourage the community to jump back into the water. 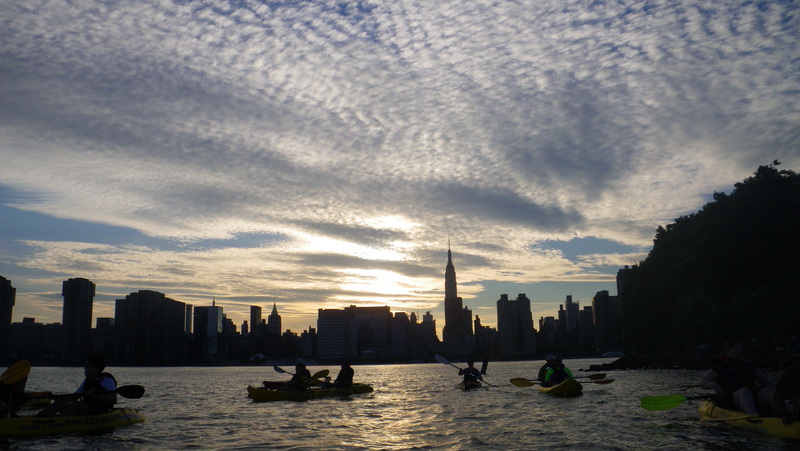 In recent years, I’ve kayaked around the island of Manhattan at night for ten straight hours, resting at small beaches and other free public kayaking clubs around the borough. I’ve seen beautiful shoreline in Staten Island, Queens, Brooklyn, Manhattan, and the Bronx, as well as the harsh remnants of the Five Borough’s broken industrial docks and rotting timbers. On the whole, it’s a beautiful sight. Except for a few nasty places here and there, like the Gowanus Canal in Brooklyn or the Newton Creek. The latter small creek, located between the boroughs of Brooklyn and Queens, was and still is, an industrial wasteland. Back in the day, a massive oil spill combined with oil leakage from the companies that used to thrive along the riverline, has rested at the bottom of this creek for a long, long, time. After years of petitioning and review, the Newtown Creek is now a Superfund site and as such, the restoration of its health is a National priority. Here’s a story at Gothamist about the Creek, and includes a photo that I took while kayaking down the inlet a while ago. Here’s a full set of Newtown Creek photos that I took from 2007 on Smugmug. We are lucky here in New York, but a lot of places aren’t so lucky. Pollution, poverty, lack of sanitation, et al, takes a toll on the water and the land, wherever you are. If you like a clean environment and are looking for a good cause, there’s a fan-based initiative that started at the Green Day Community over the last four months called “Green Day Across the World.” I am not quite sure who the idea started with, but it ended up being a collective effort ultimately organized through sheer tenacity and true grit into the “Green Day Across the World” environmental event. It’s a day to honor both Green Day and a green world. The event will take place on May 28, 2011 in a city and town near you. Please note that this is a fan-based initiative and it’s going to take fans to pull it off, which means you! If you’d like to learn more about both the event and what you can do to host an event in your city, town or area, please visit the Green Day Across the World website or click the logo above. You can come up with your own environmental themes and issues. To get involved, you can send a message directly to dawnwilcox1@gmail.com and can also find them on Facebook and Twitter @GreenDayATWrld. From what I understand, Billie Joe and Adrienne have both heard of this event and while I do not know if they have officially endorsed it, they are said to be enthusiastic about it. Find out more information from the website on prizes, t-shirts, action groups, and events. I believe that all money except for operating costs will go to the National Resource Defense Council. I’ll write more in the coming months about the event as details unfold! I did not help to organize this event, so all questions should go the email above for more information. Thanks to Dawn and everyone at the Green Day Community who worked so damed hard on this. You guys all rock. If you’re a member of the Green Day Community, here’s the thread at the GDC. Violeta from the Green Day Community, who created my previous banner, kindly updated Green Day Mind to start the year off and commemorate Green Day’s first concert of the new decade that happened on January 12, 2010 in Bangkok. The photo was taken at the press conference given by the band on Sunday, January 11, after they landed. Thank you, Violeta! Awesome job, as always! When describing “21st Century Breakdown,” Green Day usually says that it’s a (paraphrasing) “collection of pictures of things that happen in the world and America with a seeming new crisis everyday.” The onslaught of everyday living can be overwhelming, that’s for sure. I really hope, however, I never get to the point where I don’t care what happens to someone else, as long as I’m left alone. The planet really is too small for that crap. I may not be able to do much and I may not know everything or even anything, but this I know: Iranian men are beautiful and Persian culture is about 500 times longer than ours. I also know that what happens in Iran doesn’t stay in Iran. What happens in Iran affects us all. Now, I’d just like to say, what happens in Haiti doesn’t stay in Haiti. 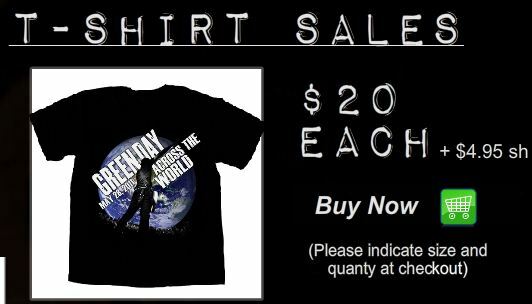 What happens in Haiti affects us all because here’s another 21st Century Breakdown moment happening, and it’s a doozy. As you may have heard, the country of Haiti, located in the Caribbean and sharing the island of Hispaniola with the country of the Dominican Republic, suffered a devastating, 7.0, earthquake on Tuesday that ripped through the Haitian portion of the island, demolishing the capital, Port-au-Prince. Needless to say, not many buildings stand and there are a lot of people who have died. It’s the very definition of a humanitarian crisis, and that distinction was already in Haiti prior to the current situation. Haiti is a country that has suffered centuries of deprivation, political mayhem, natural disasters and human misery. The Haitian portion of the island was colonized by the French, who brought slaves from Africa to work the land. The legacy of slavery in Haiti was one of the worst ever in terms of conditions of living, disease and despair. In 1791, the slaves of Haiti overthrew their masters, and after several years of fighting, Haiti became the site of the first and only successful slave rebellion. There have been coups since then, political mechanizations both inside and outside of the country; hurricanes have battered the land, and the forests of the island, milled to within an inch of their lives, have been cut down for sugar cane fields, the timber industry and the lighting of the family hearth. The population is black and poverty stricken, full of proud people who love their country and are tired of its ongoing misery. Haiti needs help right now. Food. Water. Shelter. Doctors. That is all. There should be no argument, no thinking about the need to do it, only how to do it. I was a bit hot under the collar yesterday when Pat Robertson, an evangelical minister here in the United States claimed that Haiti continually suffered because they had performed Voodoo ceremonies and bonded with the Devil in order to gain their freedom from the French. Because, y’know, that’s the only way Slaves could ever overcome their Masters, I suppose. OK, he didn’t say that last part, but that’s what it sounded like to me. I’m not even going to go into what Rush Limbaugh said about the situation, I’m already bordering on my head exploding. Suffice it to say, it’s not the time for such talk. Food. Water. Shelter. Doctors. I have a friend in Haiti at the moment. She works for a Non-Governmental Organization and was sent to Haiti to help with the country’s computer infrastructure. She’s now huddling in a company place. She’s lucky. She can leave and has a bed to sleep in. There are millions in Haiti who have neither luxury. If food, water, shelter and doctors do not arrive and are mobilized soon, an out-of-control situation will escalate into more of a nightmare than it is already. Please consider contributing to the American Red Cross or Doctors Without Borders, or any charity that you may wish to donate to. There may also be food drives in your area that need help as well. Haiti’s natural resources such as forests and water supplies are decimated. Learn more about natural resources and how you can help stop deforestation and water contamination at the Green Day + National Resources Defense Council here. I have been crying a lot over this today. But Violeta’s banner made me a bit happier. After the jump, you can view his design from last year.